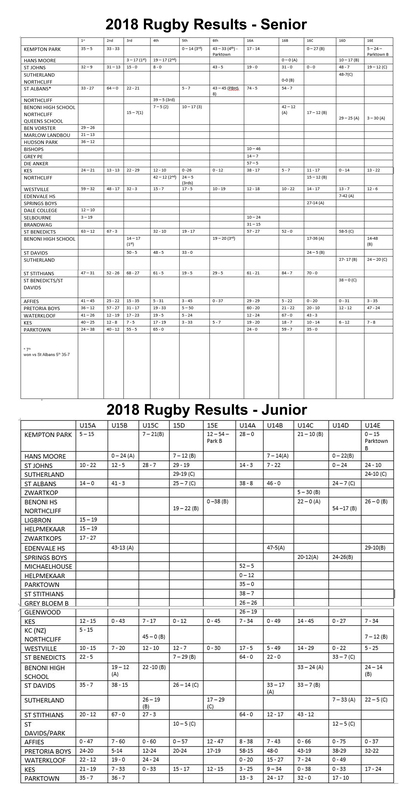 Please click the link above to open a pdf document with all the relevant information for the 2018 season. We move the ball away from pressure as quickly as possible, we run at gaps – not at people – and we create gaps by keeping the ball moving and moving wide. Jeppe boys are not frightened to play attacking rugby. Some may call it high risk rugby, and maybe it is, if you do not have the skills. We are fortunate that from Grade 8, our boys are taught the skills of the game, and also how to think strategically. As a rule, Jeppe does not play “drilled” rugby; we play “free-thinking” rugby. When it comes time for a boy to leave Jeppe, our hope is that he leaves with fire in his soul, not hardened clay. We hope that he is more than just competent. We want the boys that we educate to be poets, not merely journeymen. Therefore, although the coaches obviously focus on giving the players the necessary skills, they also go beyond these skills to encourage their players to be free thinkers: uninhibited but controlled; exciting and different, but not foolish. The Winter sport at Jeppe for many years was Soccer. But in 1935, along with many other schools, Jeppe switched codes and played its first match against KES, the school that remains Jeppe’s most serious Rugby rival. Like most English medium schools in the old Transvaal, Jeppe did not take part in competition for the Administrator’s Cup and resisted pressure to do so. But it certainly did not lack exciting and demanding fixtures. 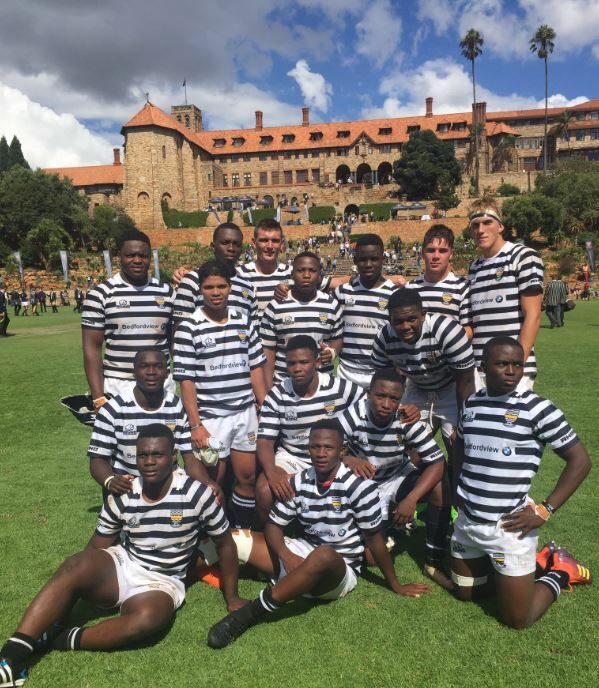 Jeppe High School for Boys has a proud rugby tradition. Sportsmanship is something that is always stressed and results throughout the divisions are consistently good. 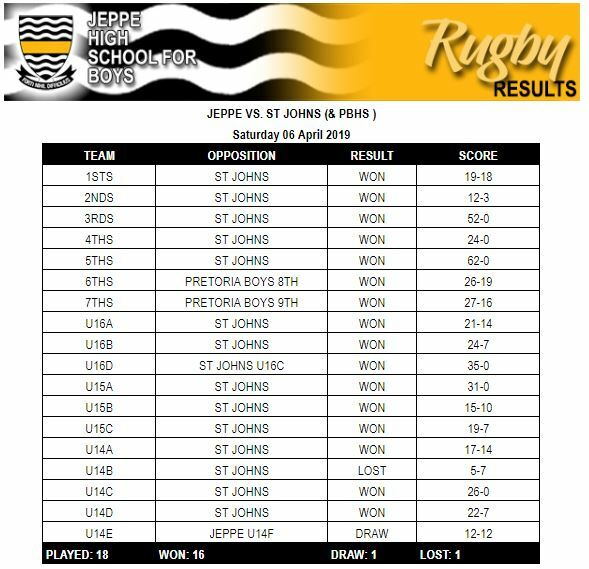 An unbeaten junior team is a common occurrence, but the Jeppe 1st XVs have only had three unbeaten teams – in 1954, 1959 and 1967 – although in many years the 1st team have lost only one match in the season. 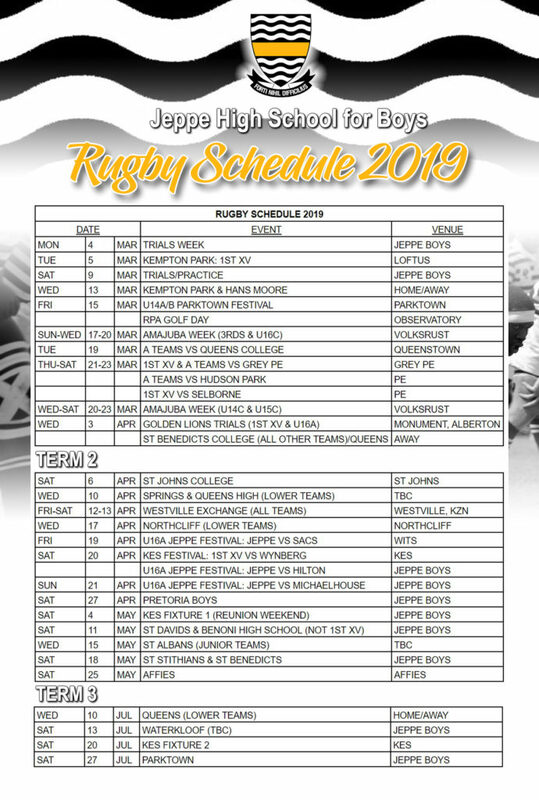 Since Jeppe began playing Rugby, fixtures have been against other boys’ schools such as King Edward VII School, Pretoria Boys High School, Parktown Boys High School, St Benedict’s College, St John’s College, and St Stithian’s College. Affies, Waterkloof, St Albans, Westville, Northwood, Helpmekaar and Monument are fixtures that have been added in more recent years. Des Sinclair and Wilf Rosenberg, both centres and contemporaries in the Springbok team. James Dalton and Brent Moyle, contemporaries in the Jeppe front row. Jake White, who led the South African team to victory in the 2007 World Cup, was a learner and master at Jeppe and is certainly Jeppe’s most famous international rugby “star”. Hacjivah Dayimani (2015), Wandisile Simelane (2015/16) and Tyrone Green (2016), all represented SA Schools. Hacjivah was also part of the SA Schools 7’s team that won gold at the Common Wealth Games in 2015.